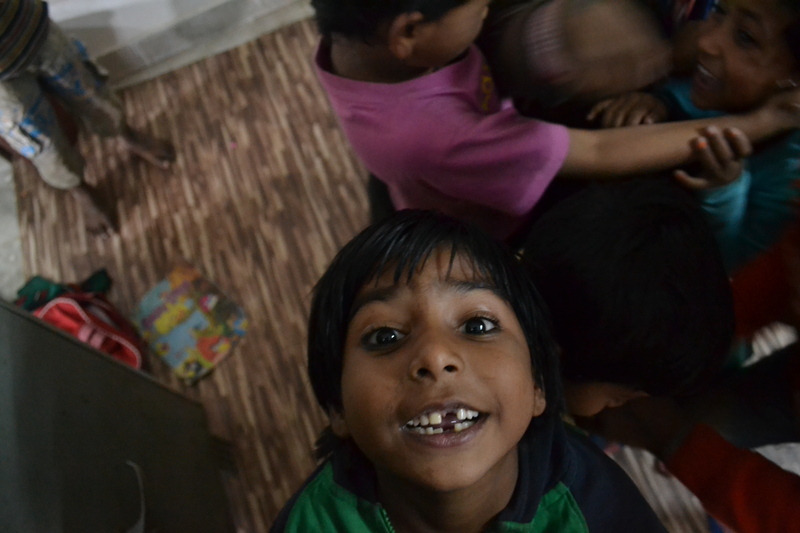 Not the boy in the story, but a child whose life I may be able to impact :) From the slum school at Masoodpur. He held onto the railing and bent his body into a V so that I could only see his face and hands from inside the vehicle. His tin bucket with a string of jasmine flowers on the handle, was resting on his dusty hand. He looked at me the way a boy might look at his mother’s friends when first introduced at a Christmas party — secure yet shy, letting me know he was a little boy with little ideas and that he somehow revered me. I looked into his eyes, hidden beneath long, thick and dark eyelashes, and read the simple language of his gaze, pleading me to come to kindness, pulling at my heartstrings, pulling at the basic chords of my heart. He was so handsome and the traffic light stayed red for long enough for us to acknowledge each other as unique individuals, coming to know each other’s hair colour, smile and the curves of our faces. He said nothing, strangely, and he did nothing except briefly put his hand to his mouth in an Italian magnifico-type gesture, yet one that hardly meant magnificent at all. As he bent and twisted his body as a shy boy would do, his tin bucket slipped off of his hand and onto the road, the sacred oil pouring out of it, his meagre day’s collection exposed, drowned by the shimmering oil. My heart felt as sunken and heavy as those coins looked. My rickshaw pulled away as the light turned green while the boy scrambled to pick up his overturned tin. The boy will supposedly take those flowers at some point to the temple for worship. He has been taught that if he offers these flowers to the gods they will rid him and his family of tamo and raja gunas — the two parts of the mind that cause the ‘true reality’ to be veiled and the ‘real knowledge’ to be completely hidden, respectively. Offering these flowers is a request to the gods to provide health, wealth and happiness. So when those flowers were spread into the gravel road by the thick oil, it must have been the look on his face, the way he jumped to pick it up, the way the coins looked sad and heavy, the way he ran away without looking back, with the tin bucket it his hand, trying to rescue the flowers from the weighty oil — it must have been his witnessing, in the simple language of his child mind, the slipping away of the prospect of health, wealth and happiness from him and his family, that tore me apart in that moment. Actually, I know what it was, it was the truth that hit me — the tragic truth that his beautiful face will most likely be worn away by the frail hope he puts in his oily string of yellow jasmines as health, wealth and happiness, those most ephemeral things, will pass him by every day of his life as I did in that rickshaw. They would look at him as he faces the gods he offered the flowers to and they would look him as he faces people like me who stop at the traffic lights, look him in the eye with the most genuine sort of love, and swiftly move on as the light changes. I was just another person who sunk his jasmine flowers into the road with the slow-seeping oil of my helplessness. Knowing that instantly broke my heart. So I am here in New Delhi, India, constantly brainstorming. There are so many street kids and children selling things at traffic signals and at markets. I watched the movie Traffic Signal while in India and had to fight away the anger and torment of the reality in cities like Mumbai and New Delhi, the reality of corruption that guises itself as piety, the reality of the big horrible man, behind the smaller mean man, behind the hardened boy, behind the little road runner, the boys like this one. I know that giving money to a boy like my little Aslam at the traffic lights doesn’t necessarily mean that he will be fed that night to make him stronger and more able to learn, or put it in a bank where he saves up for an education, or put it towards his family to rent a home instead of living beneath a flyover. Most likely most of this money will go to that hardened boy who will then give most of that money to the small mean man, who will report with the wad of cash labelled ‘from the gullible fools and foreigners at the traffic lights’. The money will fuel a vast drug trade or the indulgent lives of few pompous and evil men, while my little Aslam carries his bucket to the traffic signal every day and has his yellow jasmine flowers marked by the tyres of rickshaw after rickshaw. So how can I help my little Aslam? How can I stop myself from losing my heart as a little piece of it stays with each of these children (there are so many)? I know that the answer is not to run away to Surrey, England, where there are no street children, so that I can ‘guard my heart’ and essentially cover my eyes and ears. The only answer is that I am one person, with limited time and resources, but I am enough to care for one life at a time. At first it might mean carrying around bananas to give away to these children — they say that bananas are the poor Indian’s delight as they are filling, cheap, readily available and packed with nutrients and energy. A step further is the time I will spend in a slum school in Masoodpur, India. A step further will be my words and actions and the things I teach the children there whose names I will learn. A step further will be to remember those names, pray for each of them and expose them to the possibilities beyond begging at traffic lights, beyond child labour. I feel so privileged to be here in New Delhi, able to learn their names and teach them something, each moment here feels more purposeful than weeks of my life in more developed parts of the world. It reminds me that each life matters and we must do what we can to change one life at a time. There are so many others like Aslam, in India and in other parts of the world, so many people in dire need, but there are also so many of us, people who have in abundance, who have the time, the skill, the faith and the love. One by one, one to one, one, two, three, four… 7 billion. The point is, they need me, they need you, they need all of us. Let’s not let our life be merely thick oil running over dying jasmine flowers.